I've not done much carp fishing in my angling lifetime, except I guess for jaunts to France fishing their highly commercialised venues. I must admit though, this doesn't inspire me as much as the wild, weedy nature that these big gravel pit waters are often accustomed to. After my dibacle last season start where I made the effort to prebait this 350 acre local gravel pit to fail in my quest to catch one of these stunning dark commons this venue yields. It never felt further if I am honest, my intention to stick with it quickly descended into 'time' able to put into it, sadly time I didn't have. So, as the start of the 16th approached I was eager to put in the effort (Last years effort did take a lot out of me), certainly not in the same way as the start of the season before, but enough to give me a chance. Pre baiting the area a couple of weeks before with rapeseed, maize, wheat and finally REDEMPTION boilies I was hoping this would be my time at redemption. 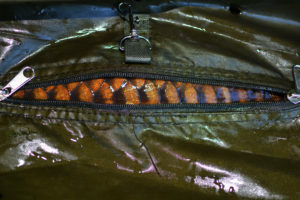 As I began to set up, I was eager to really learn what this carp fishing mallarkey was all about, was it really all it cracked up to be, was waiting hours by yourself really something these boys did for enjoyment? I am used to a quicker pace, more action style of moving water and barbel fishing so this was really, to be honest out of my comfort zone. 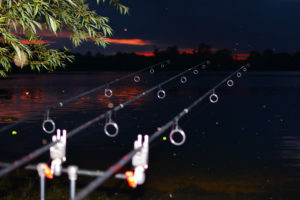 However, I embarked on a two night session to really try and capture the true essence of carp fishing, and truly take in the peace, relaxation, tranquility and ambience that it had to offer. Woodpeckers replacing BMW's hoofing it down the bypass, Kingfishers perched on island scrapes. Was this the true definition of angling, was this what wild carping is all about? For me it certainly wasn't about anything else, true wild fishing, in their environment bringing me closer to their natural world. I don't get that sense of enjoyment, fishing in any other way to be honest, maybe here I have finally found it...maybe here I have found the solitude and seclusion away to challenge myself. 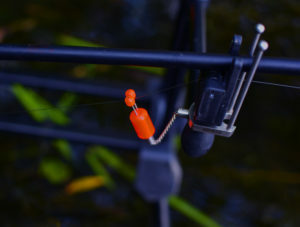 I began with 2 rods on the IQ 'D' Rig with size 6 Bank Tackle hooks with a REDEMPTION wafter, with a little twist. I had one on a stiff hinge rig with a REDEMPTION pop up rig. The challenge doesn't get much larger and I was questioning myself whether this was really for me after the first night passed without any sign. I didn't sleep all night, worrying, thinking is it going to happen again, will I blank? At around 4am my hopes, dreams and what I've been waiting for, the sound of a 'one-toner' (apparently it's a 'carpy' term). I quickly got my boots on and raced down the bank to hit it, once I did I realised this was getting its head into weed, deeper and deeper as it ran and the spool spinning like a top. After a brief time (which felt like five minutes) it managed to stop and I felt weed grating, my hopes, prayers rested on this fish, what the hell?! 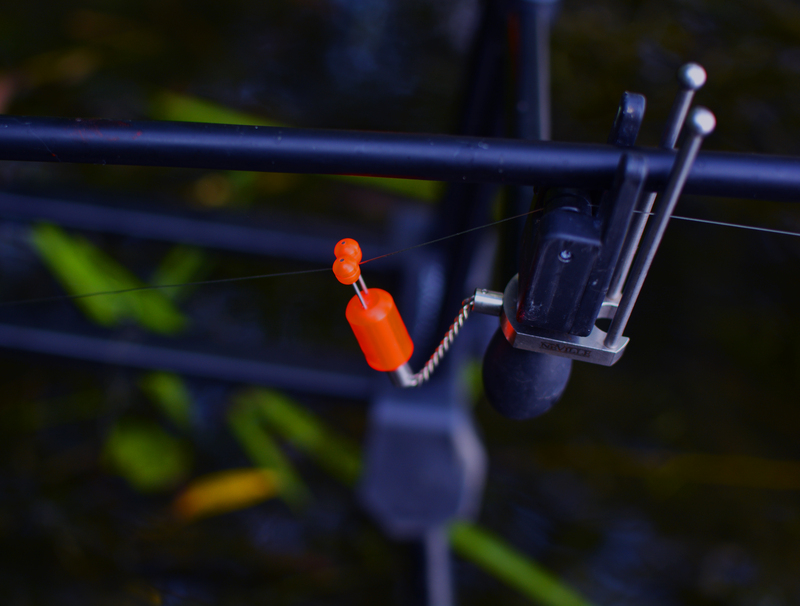 Before I was beggining to think the whole carpy world was against me, I managed to feel some plodding and I wasn't about to let it get another chance as I managed to excert some pressure and before long it was mine. As I was sorting out the sling until it got light and some photographs the other, middle rod poured off. I couldn't believe it, this time I was quickly onto it (standing right there) but it still did the same thing, through the weed. 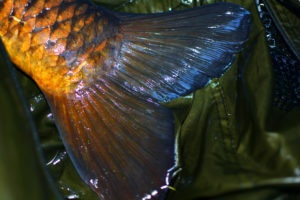 I immediately felt it to be a better, bigger fish as I could just feel the ploddy characteristics of a bigger fish. I kept the pressure on and kept the rod high and it eventually came out. I remember thinking, if this is all fish (and not weed with it), it's a lot bigger. As I got it in close I could see this was significantly bigger. I managed to call Rob which I am sure he appreciated at 5.15am to see if he could help, I really didn't know how big the fish was and was hoping he could come over to take pictures. A friend in need is a friend indeed as he popped over on a bus and got there within the hour. As he was just about to arrive my middle rod that was cast into the spot again melted off and I was into a third, this was surreal! After the inevitable run through the weed I was quickly able to get it into the net where I already had the bigger common. After deliberation we decided we would sort photos and weigh them all to find that my scales got waterlogged and didn't work. Oh disaster!!! Rob said he would go and grab his and come back. After a brief wait, Rob returned with his scales where we quickly weighed the biggest two and let the other go which we estimated at a mid-teen after getting a picture or two. Once on the scales the bigger common weighed 27lb 12oz which was beyond anything I could've imagined on my first session here. 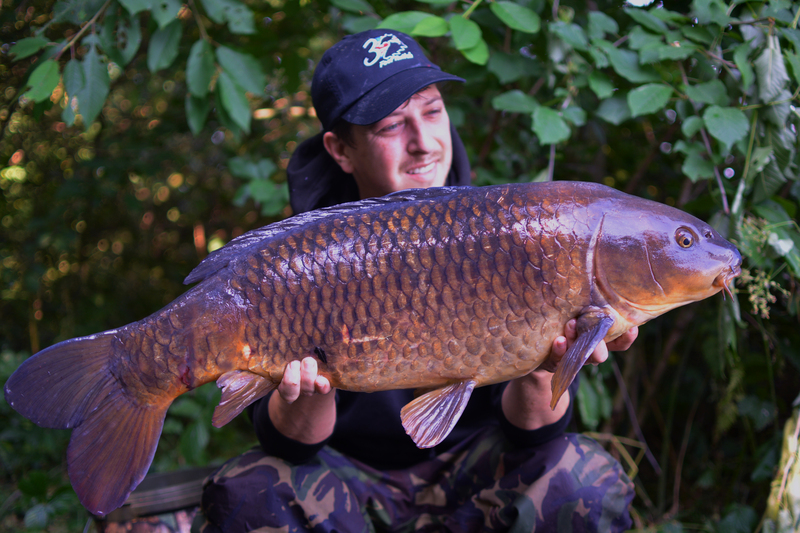 A beautiful dark, big common I was absolutely buzzin'. Rob was also available on my PB barbel and now my PB English carp. All from a stunning place and wild fishing at its best. The second was 18lb 11oz so as you can imagine I was delighted, all this in a space of an hour, carnage ensues. The rest of the day passed without incident, apart from one aborted pick up. 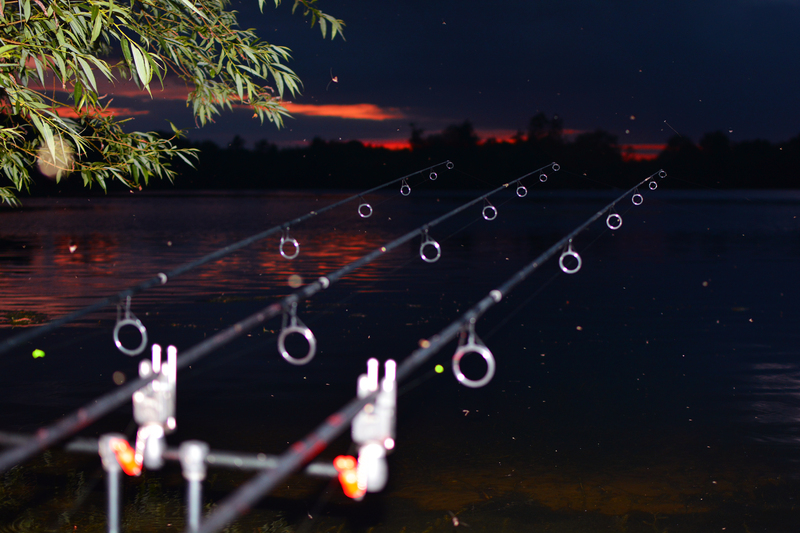 The last night yielded one beep, until the morning at 6am where I got my last fish at 19lb 15oz. So did I capture the essense of what carping in its purest form is all about? Yes, I did and not on any commercial 'runs' water either, this was vast! Did I get my REDEMPTION? Yes I think you could say that. Would I do it again? What do you think? I think I've found something that not only challenges myself in my angling, but found something within me personally that makes me want more. 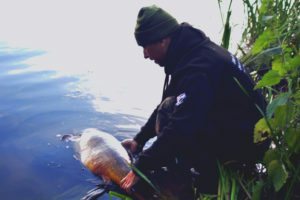 Pictures...27lb 12oz, 18lb 11oz and this morning's 19lb 15oz all caught on REDEMPTION wafter. Many thanks to Robert Bown for coming out in my hour of need.